Soft hook pellets flavoured with The Source, which is a popular boilie ingredient for carp. Almost a deep burgundy colour, these dark pellets are available in 4 mm, 6 mm and 10 mm sizes and have an oily aroma. You get a big helping in a pot, easily enough for several hectic sessions, and there are several complementing Source baits that can be used with them. The packaging suggests these moist pellets are suitable for pole, waggler or feeder fishing. Personally I found them okay for shipping out on long pole, but I don’t think their consistency is firm enough for robust casting with waggler or feeder tackle. 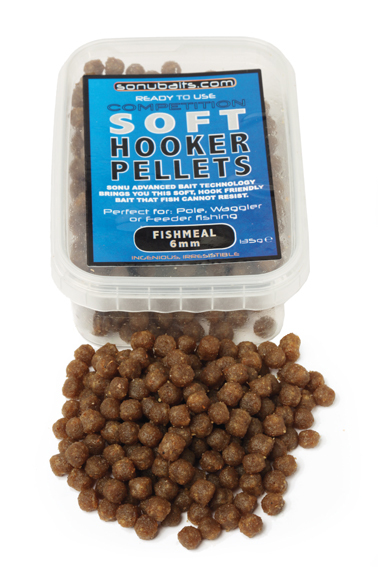 Darkish brown pellets in popular 6 mm and 11 mm sizes, infused with soluble fishmeal and Betaine. You get a good amount in a 150 gr re-sealable bag – enough for several busy sessions. These soft-consistency pellets give off a strong fishmeal aroma and are designed for direct hooking with pole or waggler tackle, while the packaging suggests hair-rigging for feeder methods. I found these pellets okay for all pole applications, but a tad too soft straight from the bag for waggler or feeder work. The bag contained a mixture of sinkers and floaters, which perform better if left to dry out for a while. 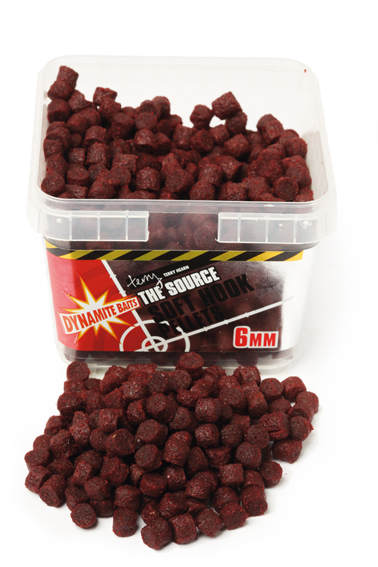 Dark brown fishmeal flavoured pellets, available in 4 mm, 6 mm and 8 mm sizes. These are supplied in good-sized 135 gr pots, easily providing enough hook baits for several sessions. The pellets themselves are sinkers, with a soft, spongy consistency, and they’re absolutely oozing with oil. Designed for pole, feeder or waggler fishing, this bait hooks easily and stays on well for all but the most demanding of casting regimes. The pellets gave off an oily aroma with just a hint of fishmeal coming through. I’ll certainly be spending more time experimenting with this above-average bait. 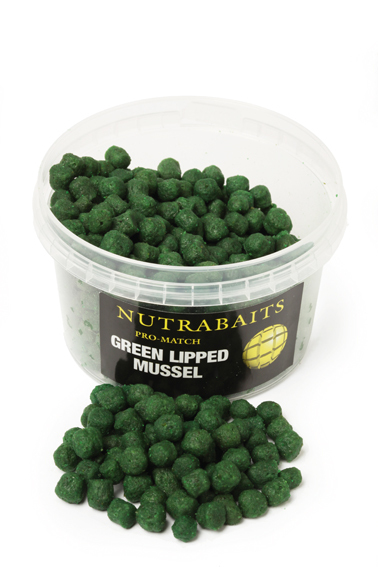 Available in 6 mm and 11 mm, this range includes Green Lipped Mussel, Trigga, Caviar, Boosted Betaine, Smoked Salmon and Fruitopia. 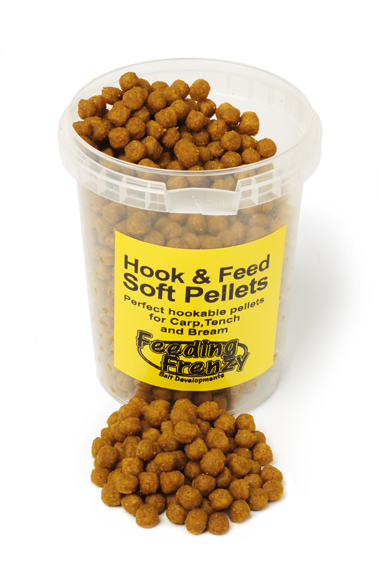 There’s enough bait in a pot for several sessions, and these soft, spongy, semi-buoyant pellets offer a good range of colours to match their flavourings. The 6 mm size had a robust enough consistency for pole fishing, staying on the hook pretty well, even after missing bites. I particularly liked the Green Lipped Mussel and Smoked Salmon flavours, which had slightly firmer consistencies and were just about strong enough for waggler fishing. 520 ml tubs of hook and feed pellets. These are available in Bloodworm, Halibut, Scopex, Strawberry and Tutti-Frutti. The light brown Scopex pellets gave off a fresh seafood aroma similar to cockles, which is a nice change from the stale smell some hook pellets emit! These 6 mm pellets also had a nice spongy consistency and were robust enough for waggler fishing. They’re floaters, but a light squeeze underwater (or the weight of the hook) sinks them. Five mixed pots cost just £10! 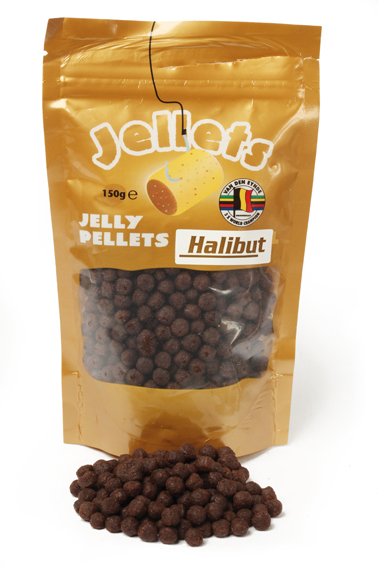 Jellets are rubbery sinking pellets, packed in 150 gr re-sealable bags, available in Natural, Strawberry, Green Lipped Mussel, Halibut and Tuna flavours. The dark brown Halibut flavour featured here provides a mix of 4 mm and 6 mm hook offerings. This bait is soft but hooks cleanly without breaking up, being suitable for pole, waggler and all but the most demanding of feeder fishing methods. I’m a big fan of Jellets, particularly the Halibut and lighter orange Tuna options. This brand doesn’t have that nasty pungent smell some prepared pellets give off, and the fish loved them! 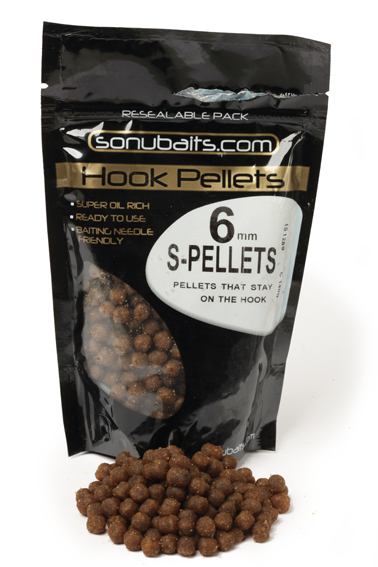 Dark brown pellets rich in oil, with a strong fishy smell, offering 4 mm, 6 mm, 8 mm and 11 mm size options. These sinking pellets are much firmer than most other brands, staying on the hook better with all float and feeder regimes, also being hard enough to hair-rig properly. S-Pellets leak out fish attracting oil and are designed for year-round usage. Probably one of the best choices for direct hooking when employing demanding waggler and feeder methods, although I find it pays not to hook these pellets too deeply, otherwise you risk bumping fish, due to their firmer nature. Mid-brown 4 mm to 6 mm pellets in round and slightly elongated shapes. 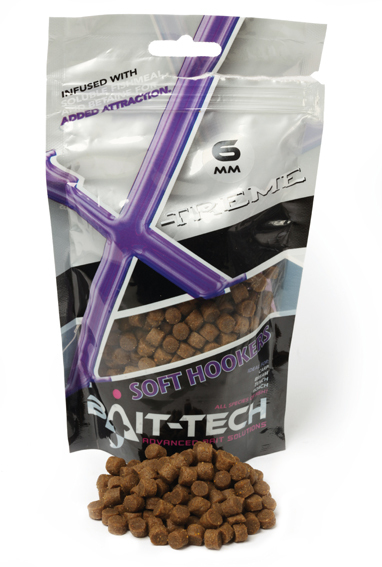 These floating pellets have a mild fishmeal aroma and feature toughened skins. This creates a consistency that anchors on the hook brilliantly, but without being too firm to cause bumped fish on the strike. 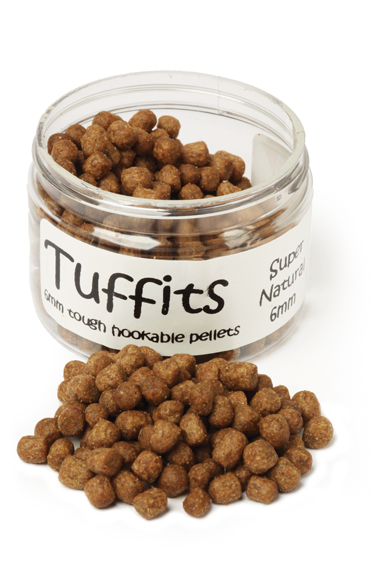 Available in Natural, Strawberry and Halibut flavours, Tuffits are perfect for all forms of presentation. This hook bait stays attached with the most vigorous of casts, while its buoyant nature counters the weight of the hook, which pulls more positive bites. During testing this product was the most effective. NOTE: All products tested July 2009. All prices correct at the time of going to Press. Angler’s Mail do not take responsibility for price or product changes or current availability.